1. Fold each sheet of parchment paper in half. Trim to make 4 heart-shaped pieces. 2. Open each heart of parchment paper. On one side of fold line add 1 tbsp (15 mL) each raisins, pecans and ginger; 1 each cinnamon stick, licorice root, vanilla bean and clove; 2 each pear, apple and apricot pieces; 1 each peach and plum quarters. Sprinkle 2 tbsp (25 mL) cider over each; top with 1/4 tsp (1 mL) butter. 3. 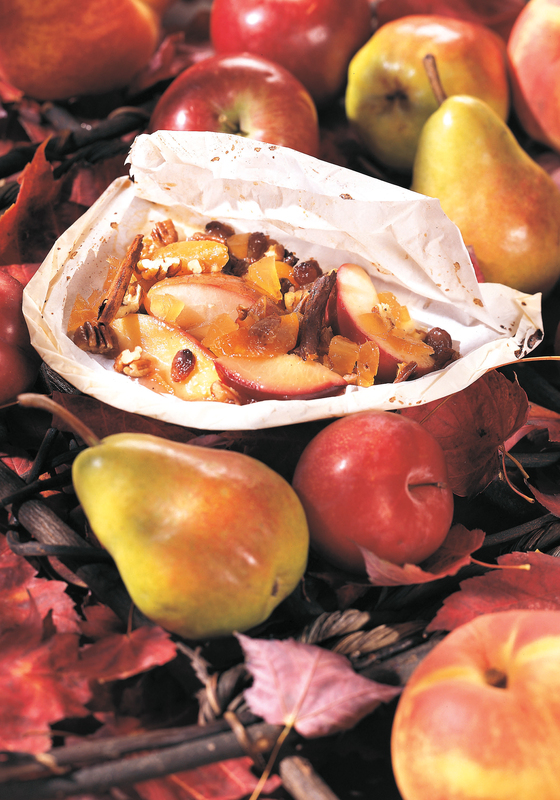 Fold other half of parchment heart over fruit. Beginning at curve of heart, roll cut ends together to seal. 4. Place fruit packages on baking sheet. Bake in preheated oven for 30 to 40 minutes or until apples and pears are tender. Slide each package onto a serving plate; cut an “X” on top of each package with a knife. Pull back tips of “X” to make an opening. Serve warm in parchment. Parchment paper (not the same as waxed paper) is used to line baking sheets, cake tins and to oven-steam fruit, vegetables, meat and fish. It seals in cooking liquids and keeps food moist as it bakes in the oven.